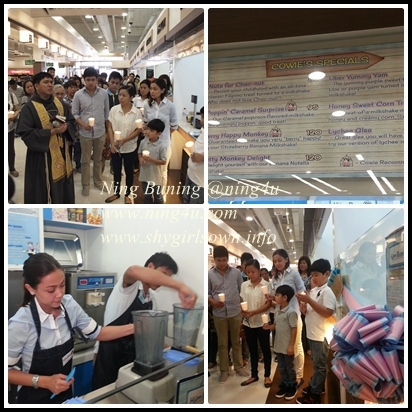 A visit to the South part of the Metro is more enjoyable because The HAPPY BARN Milkshake Factory is already available at Rustan's Supermarket, EVIA Las Pinas City. In Europe "Barn" means child or kid, and I am sure you will be happy as a kid every time you'll visit the place. Partly owned by our noontime favorite yaya, yes it's yaya Maya, Jodi Sta. Maria of "Be Careful With My Heart". We are fortunate to try the first milkshake treats, of the store in our country and we all are satisfied and happy as we sip every flavor of it. Different flavors of milkshakes from Poppin Caramel Surprise (popcorn flavor), Nuts for Choc-nut and Black Forest Bliss (a cake flavored shake), Uber Yummy Yum (ube flavor) and Nutty Monkey Delight (nutella-banana flavor) are being generously served. They are all sooo...delicious and generously serve with smile by the makers of milkshakes in the store. Did you know that it is guilt-free in terms of calorie and fats, yes it is because they have formulated fat-free vanilla ice cream. "Yes, you can take as many milkshake as you want, because it is fat-free, we had formulated a combination of healthy and delicious ice cream which is the main ingredient of our milkshake" Jodi explained. 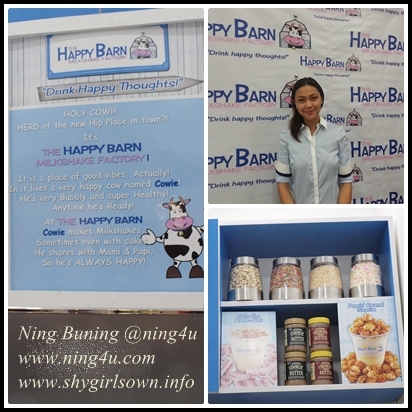 The Happy Barn is also a proud Filipino made because most of their ingridients came and made from our country like the ice cream, chocnuts etc. "We made sure that most of our ingredients are available our country to avoid delays of supply and to give employment to many Filipinos" Jodi said. Aside from wide selections of milkshakes, Happy Barn also serve Eggettes, a ball waffle that is crispy on the outside but soft and chewy on the inside.